Lets talk teaser posters and trailers. When I say teasers, that’s exactly what they are. They don’t reveal anything about the movie, or if they do, they only give you very little to work off. Not that it is a bad thing to let everyone know before the movie comes out what it is about because the majority of people want to know what they are getting themself into, but teasers create an air of excitement about the movie. I bring this up in this review because that is very much our first exposure to “Salt” was. 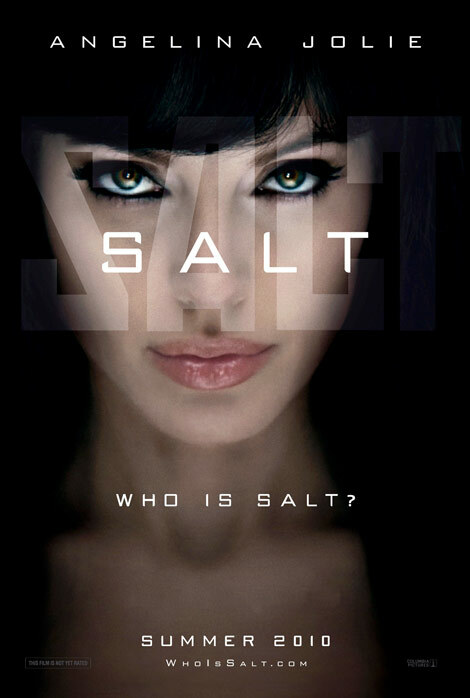 The first poster released was a close up of Angelina Jolie’s face with the tagline “Who Is Salt?” What did this poster tell us about the movie? Besides the fact that Jolie is in it, nothing. Love her or hate her, there is no denying that Jolie has an amazing amount of star power. This is the first movie she has done since the birth of her twins, Knox and Vivienne and it is as though she never left. She is still box office magic whether people know what the movie is about or not. Of course this tactic doesn’t work if a big star isn’t in it or if it isn’t a Disney movie. Disney is great at teasing. Let’s use “Up” as a case study. The poster and trailer for it reveal not much more than it is a movie about a man who lives in a house with balloons attached to it and his young friend and dog. The movie could go in any direction from there. “Inception” is also a great example of teasing. I would’ve given an award to anyone who could tell me what “Inception” was about after watching the first trailer released. It gave nothing away, but everyone was intrigued because there was Leonardo DiCaprio, it was directed by “The Dark Knight” director Christopher Nolan and there were some amazing special effects. I love the idea of teasers. They make the movie watching experience just that bit more exciting even before you step into cinema. Terrific marketing . “Who Is Salt?” The perfect tagline and the question that bugs you for 100 minutes through “Salt” and will for days after you have seen it. It is so refreshing to see a smart action film, one that combines great special effects, a smart script and a tough female lead. It is rare that an action film will challenge you so psychologically and rely solely on special effects and bomb blasts to move the film along and keep the audience entertained. Not to say that these aspects of the film aren’t entertaining or hurt the film, because they certainly do not. Evelyn Salt. She’s a CIA agent who is blissfully married to an arachnologist. Or is she who the strange Russian man who has turned himself into the CIA says she is, a Russian spy who is on a mission to kill the Russian president? There is not much more you can say about “Salt’s” plot without giving away too much about the film. It is brilliantly written and exceptionally well directed by Phillip Noyce. It is far more mentally challenging than one would expect it to be based on the plot summary. It is not a lazy film by all means and far from a mindless action film. Throughout the film, it is a struggle to see where the film is going as it is completely unpredictable, another sign of great writing and directing. The cinematography is very well done with some great special effects and action shots throughout the film. For once, an action film that is not based on an old TV show, old movie or a comic book. It stands alone as a great story in itself. It is almost as though writer Kurt Wimmer, took a politics and decided to throw some action into the equation. The Noyce and Angelina Jolie combination proves to be a winning combination, as it did now over 10 years ago in “The Bone Collector”. She is perfectly cast as Evelyn Salt. Not only does she cover all bases that a female action star should, she also shows her true acting ability. Everyone knows Jolie is a great actor, she has shown her versatility in many of her films and this is just another one of those films. She goes between two extremes in this film and does brilliantly at all times. She creates a great deal of mystery and the film would be nowhere near as successful as what it is without her. It is interesting that this film was originally written with a male as the lead, and that male lead was to be played by Tom Cruise. When he pulled out, Jolie stepped in and the film was rewritten with a female lead. It’s hard to see how the film would have been as good with a male lead, and having Tom Cruise as the lead would have been too much of a flashback to “The Firm”. Schreiber is as good as he can be in his role as Salt’s business partner, Ted Winter, but is better in some parts than others. Chiwetel Ejiofor is very good as Peabody, changing the way the audience sees him throughout the film. Although Jolie is Salt and is the star of the film, she is not the only part of this film that makes “Salt” a winner. It is extremely clever and very well made. It is not only action fans or Angelina fans that will enjoy this film. Although a mentally strenuous film to watch at times, it is completely refreshing and a tribute to Noyce and to Jolie. Hmm...may have to check this one out!